Nick Cosgrove playing as one of the Jersey Boys, two performances each week at the Bank of America Theatre through June 3, 2012. 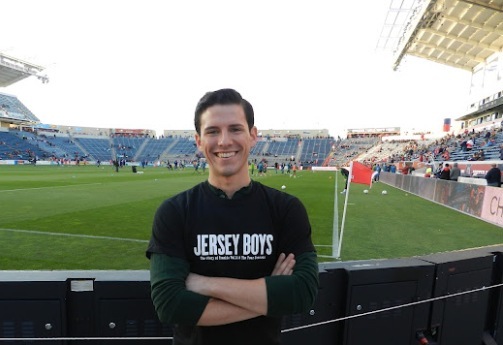 Cosgrove in the role of Frankie Valli, he performs on Tuesday nights and at Wednesday matinees in the current national tour of the Jersey Boys in Chica. The 24-year-old actor, with a four-octave vocal range, talked with suntimes.com about playing to the hometown crowd. Q: How did you decide that a life in theater was the road you wanted to take? Q: So Sinatra’s music was a big part of your childhood? A: I grew up hearing Sinatra. My mom loved him. My Grandpa Cosgrove would listen to Sinatra and then hear me sing and he would call me The Voice. We’d listen to “Mob Hits,” Tony Bennett. I was listening to oldies and Etta James. Q: You portray Frankie Valli twice a week. How similar is your voice to his, which is just so distinctive — and high? A: (Laughs.) Growing up I was a boy soprano. Then my voice changed, but it’s always been a very high tenor voice. I was trained classically as a singer and it’s been such a huge help with my vocals. In college I started singing more pop and getting my voice the kind of training that really helps in this show, but I wasn’t necessarily working on a falsetto. That was just ingrained in my voice since I was a kid, so it just comes naturally. Q: Was it hard for you to be the guy with the soprano voice in high school? A: (Laughs.) Actually, it was cool because I had so many different interests. I was president of student council, taught dance class, was a Phys Ed counselor. So in some ways I kinda made it cool to do theater and sing and be in musicals and be a physical education champ. I got picked on by some jocks, but then I actually beat them out for a Phys Ed award. Q: Were you a fan of the Four Seasons before you joined this show? A: I knew a lot of Frankie’s music growing up, like “Can’t Take My Eyes off of You” and all the covers of that, especially Lauryn Hill’s version. But I love what they call “the big three”: “Sherry,” “Walk Like a Man,” and “Big Girls Don’t Cry.” It’s just a dream role to sing 27 songs in two and a half hours. “Jersey Boys” is why I went into musical theater. I saw the play in Chicago when I was in high school and from that day I said that’s what I want to do with my life. So in a way, Frankie Valli is like my Mama Rose (from the musical “Gypsy”). Wrigley Field in April. What was that like, and why is that song so hard for singers to perform? A: That was just beyond awesome. I grew up a Cubs fan, so it was just a dream come true. I do love the Sox, too. I just don’t know why people have so much trouble with the song. I got to sing it as part of a group so it was cool. Singing it solo? Maybe they’re just nervous because it’s the words that throws them. There’s really nothing to the melody that’s difficult. Q: What are some of your favorite haunts in Chicago? A: I’m gonna definitely go to the Shedd Aquarium because that jellyfish exhibit is the coolest thing I’ve ever seen. I love Navy Pier so I’ll be going there. And hopefully catch some theater, if I have time. Jersey Boys will play at Bank of America Theatre through June 03, 2012. Get $10 OFF on Jersey Boys Chicago IL Ticket Orders of $350 or more by using code #SpringSavings at Checkout! I am a huge fan of the 1950′s and their 1960′s music. It was so great to experience their story, and their music together. I felt I was back in the 1960′s. GREAT SHOW!